Provides mist at all temperature and can be applied to direct proofing, interrupted proofing, retarded proofing and also during thawing/freezing. During proofing floating aerosols settle on the dough, preventing early crusting of the skin. The dough surface is not sticky (as is the case with conventional proofing). Reduction of energy consumption during proofing of up to 60% when proofing at low temperatures. Due to the aerosols on the dough the crust will be formed later during baking. 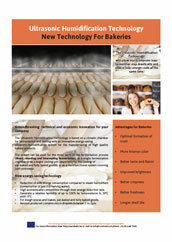 This enables deeper and faster heat penetration which results in improved baking times with less energy. Most importantyl this technology results in better product quality!